The thing about being a teacher is you have the whole summer off. And if you’re remotely introspective, that’s a lot time to think. It’s been a thought provoking first month, for sure. I’ve shared before, that the second I got on the plane to come back from the D.R. last August, I knew I needed to go back. And the amazing thing about trusting God is that he totally made it happen and in less than a year. I thought that my motivation for going back was to continue relationships with friends and kids, I’d made on that first trip, which was a worthy motivation. So, I spent a good chunk of that 10 months learning more Spanish, praying a lot, and trying to allow that first trip to continue to impact my life. It’s funny how we do these things with God’s plans. We try to make it all logical and box it up nice and pretty. Stick a bow on top and say, “Look what God did! Ta Da! !” The thing is, though, God isn’t ever done. That bow on top, it’s not going to get tied until He decides it. I can look back on this trip and then look back to 15 years ago and realize that if the thing that happened 15 years ago hadn’t happened, this part of my life could have looked completely different. So, God’s plan, His eternal plan, definitely includes these collective few weeks I’ve now spent in the D.R., but He’s not finished and these two trips, they are stepping stones in our eternal story. I turned 36 a few days ago. And that’s weird. I’d swear I was just 25 last year. So according to the American Dream, I’m supposed to have the house, the car, the career, and a life of ease by now. And honestly, all the boxes are checked and have been for quite a while now. Can I just say that it’s a crummy place to be? So now I’m in some sort of holding pattern. I’m supposed to work for 30 more years so I can retire and buy one of those RV’s that used to be a bus. Um, no. The Dominican Republic? I didn’t even know where it was. I had to look it up on a map. The first trip, I saw the poverty. Actually, I was overwhelmed by the poverty and at the same time, this light. Jesus. I think it’s easier to see a glimpse of light when physical darkness is so prevalent. It’s hard to convince Americans that we need Jesus. In the third world, Jesus is all they have. Looking back on that first trip, I feel like I mostly just floated through it, absorbing it with every sense, but not really acting on it. Not knowing how to react to it. It wasn’t until this most recent trip that I realized that, though. My mind and heart were prepared to be overwhelmed again. And I was, but on a different scale. I was moved to act; moved to use the gifts I use here in a different context; moved to create more relationships, and deepen the ones that I already had. There was no hesitance to dive in and my heart was full! I can’t pinpoint one particular moment of this trip and say, “Look what God did!” If I could paint a picture of emotion, it would have an awful lot of joy in it. It’s never easy to say goodbye, but there were no regrets, no feelings of sadness for not doing enough, or seeing enough, or being enough, or leaving things unsaid or undone. The poverty is still there. I’m still here. I’m still not sure what the proper response to knowing that kind of poverty exists is. But, my eyes are open; my heart is open, to the possibilities of playing a larger role in spreading the light of Jesus to people in poverty. I have no idea how long my earthly story is going to be. 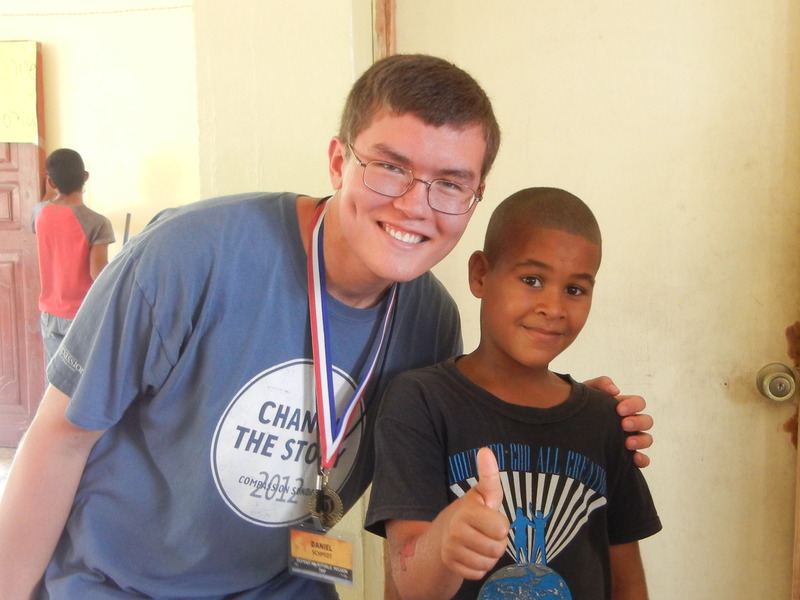 It is forever changed by the dancing, singing, smiles, hugs, prayers, and genuine joy of the Dominican people. I do know that life is not a bunch of buildup that leads to a 30-year holding pattern. I’m in this for the long haul, however long that may be. I have no idea what that looks like. I don’t think it’s a neatly wrapped box with a bow, though. I’m praying for God to show me what is next. I’m so thankful to serve a God who is not a God of logic and checked boxes. I continue to be surprised at the things I get to do for HIM. I am just a man. I have been blessed by God with many things and a pretty good life. God has been faithful to me my entire life answering prayers for Wife, Kids, Employment, Home, Possessions, as well as having a life full of wonderful memories and experiences. At this time I find myself out of work and doubting my own self worth. I think it’s normal for many people to get their sense of self worth from the job that they do and how well they do it. I have always considered myself valuable to every employer I have worked for and have always performed well. During this time of unemployment I have applied for hundreds of jobs hoping to get an opportunity to get an interview or job offer, but to no avail. I had worked in manufacturing my entire life and had great successes and very few failures. Now I felt unwanted and not needed. At this point I am feeling worthless. The Dominican Republic Missions trip with Compassion International was coming up and I have always either sent my kids or donated money to the mission’s trips at our church. Usually I am too busy at work and can’t get the time off to participate on these kinds of trips. This time I had the time and not the money. For my 50th birthday I told my family and friends to contribute to the mission’s trip so I could go. God provided. Friends and family donated all the necessary funding for my trip. God provided side jobs to pay for immunizations and miscellaneous things I needed and my primary doctor didn’t charge me for my visit to get prescriptions. God Provided. So off we go on June 21. I am at the airport with people from church I only see on Sundays and with worship team. I actually know very little about them and they know even less about me, more than likely. I had no idea what to really expect. The first service we experienced was amazing. These people face 65% unemployment, Poverty, Physical disabilities, and a very tough day to day living situation. The local men and women and children praising God and singing, even people with physical disabilities were dancing to worship him. They were expressing so much Joy and faith in God to provide. I was inspired, convicted and humbled by what I saw. What kind of man am I? I live fairly well even though I am unemployed. I have a nice home and more than enough food, clothes, toys, and trinkets. Yet I am battling depression, scared, nervous and feeling self pity about my current state. (These people are expressing so much joy). Needless to say I was an emotional basket case most the time I was there. I was working hard one minute and stepping away sobbing the next. I chose to work on the construction of a wall for most all the time we were there. It would provide safety and security for the Children and the facilities. It was one of the most fulfilling jobs in my life. I got to work with the other team members kids and parents alike as well as with the local workers. Communicating with about a dozen words of Spanish, I formed a terrific relationship with our Maestro / Journeyman Mason Fernando and his workers Francisco and Popi. It seems like such a little thing to build a wall but it took teamwork, cooperation, and patience. Our Youth were impressive. They are maturing into fine young adults that will serve the Lord the rest of their lives, I believe. We all worked hard, either with the children in VBS, (hundreds of children) or the wall. The relationships we created with the people there were so special it is very hard to put into words. The last day we were there the maestro was finishing his work on the wall and as a gesture wrote my name in the wall. What’s with that I thought? There is the name TOMAS in 3 foot tall letters. Why? I didn’t really know at first. In the same way we served in the Dominican Republic by building a wall, teaching and loving the children and the people, God used us to show them they are worth something and they are loved. Through them God showed me I am worth something and He loves me too. Every day we live is a gift of God and we as children should not take God for granted. We get so comfortable in our lives and desire so much that when we don’t get it we have a pity party and complain. Leaving there was gut wrenching. Leaving people we have truly bonded with behind and knowing how hard the days ahead of them will be. Then there is the wall. That wall is the most meaningful paycheck of self worth from God or anyone I have ever received. God loves me unconditionally. He is faithful to me. I am worth something, and I need to serve him more. I am leaning on Jeremiah 29: 11-14 at this time in my life. There is so much more I could say about this trip and the way God used it. Feel free to ask if you see me. God bless you.